When word came that Jackie Chan was making a return to America, visions of films like The Protector and Battle Creek Brawl swept through many people’s minds. But Mortal Kombat, which had come earlier in the year, proved that martial arts, which had been non-existent except for JCVD and Steven Seagal, was still popular. Jackie Chan did make his return, but did it his way, and finally Jackie found the success in America that had eluded him for so long. So what was Rumble in The Bronx like? 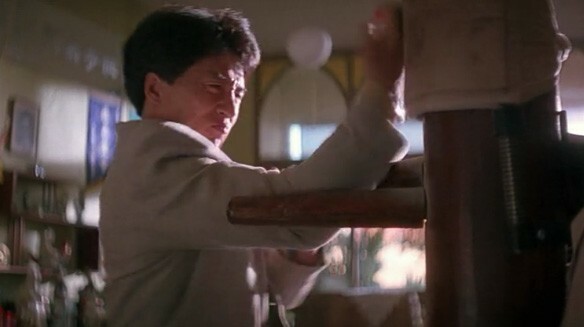 Rumble finds Jackie Chan as Keung, a Hong Kong cop vacationing in New York, there to attend the wedding of his Uncle Bill (Tung), who owns his own store in the Bronx. Not long after Keung arrives than trouble finds him as he thwarts a local gang during one of their “amusements”. He must also content with Elaine (Mui), the new owner of Uncle Bill’s store, who finds she may be far over her head. Toss in stolen diamonds, a villainous gangster named White Tiger who will stop at nothing to get them, and Keung falling for the leader of the gang’s girlfriend Nancy (Yip) and the stage is set for fights, stunts, and derring-do! Rumble in the Bronx has a story that a 10-year-old could write, dubbed dialogue, subbing in Vancouver for The Bronx, and a host of other things that would sink other films, but the hell with that, this is Jackie Chan, and while this isn’t one of his best films, it IS one of his funnest (is that a word?). Jackie plays the character he plays best, which is himself. He’s affable to a fault, a hero who doesn’t look for trouble but it surely finds him, and the physical comedy Chan is known for. Anita Mui is game for all of the hijinks, and is able to successfully share the screen with Chan, and of course no Chan film (at least his late 90’s films) is worth its salt without the greatness that is Bill Tung. The bad guys are utterly forgettable, just a group of big guys who grunt a lot and look at Chan menacingly. Stanley Tong keeps things moving at a brisk pace and thankfully never wastes time moving the story along, not allowing the logic of the film catch up to them. The stunts are just as insane as one would want. Everything from the building jump during a chase to the boat jump that broke his ankle, Chan is in top form, and nowhere is this apparent than in the big fight vs the entire gang, where Chan uses everything around him as weapons, and mixing it with kung fu that shows off Chan’s speed and grace, expertly choreographed, which for Chan fans was expected, but to American audiences it was the signal that Seagal and JCVD’s time had come to an end. If I had one gripe it might have been the absence of a Superkicker to really challenge Jackie, but that is just a wishful nitpick on my part! Jackie Chan brought his insanity to the USA shores, and we are all better for it! A rollicking, insanely fun movie that shows Chan at his best! Previous Mike Moeller returns with One Million Klicks Trailer! An all-time favorite of mine! Like many, this is the movie that opened my eyes to Hong Kong action and I’ve never been the same since.